Rooms feature 2 queen beds and offer either direct access from your car or through the interior of the inn with courtyard access. Granite countertops surround the bar and bath featuring an in-room sink, refrigerator and microwave to make your stay more comfortable. Added amenities are table with chairs, 32” flat panel TV, iron and iron board, alarm clock, coffeemaker, hair dryer, spa inspired bath soaps and shampoo, higher thread count linens, extra large bath towels, telephone, free Wi-Fi and individual climate control. Rooms feature one King bed with sofa or two easy chairs. Their location offers either direct access from your car or through the interior of the inn with courtyard access. Granite countertops surround the bar and bath featuring an in-room sink, refrigerator, coffeemaker and microwave to make your stay more comfortable. Added amenities are 32” flat panel TV, iron and iron board, alarm clock, hair dryer, spa inspired bath soaps and shampoo, higher thread count linens, extra large bath towels, telephone, free Wi-Fi and individual climate control. Traveling with friends or family? This is the perfect room for anyone needing a little extra space. The suite features a living room with queen size sofa bed, full bath, 32” flat panel TV, six foot sink countertop with cabinets, refrigerator, coffeemaker and microwave. A separate king bedroom offers a second private full bath and oversized closet and 32” flat panel TV. 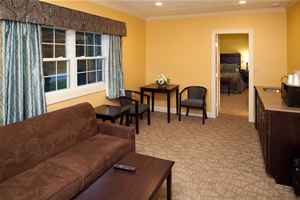 The suite is located on the second floor away from other rooms in the inn providing a separate entrance for increased privacy. Added amenities are iron and iron board, alarm clock, hair dryer, spa inspired bath soaps and shampoo, higher thread count linens, extra large bath towels, telephone, free Wi-Fi and dual individual climate control. Rooms feature one King bed with easy chair. 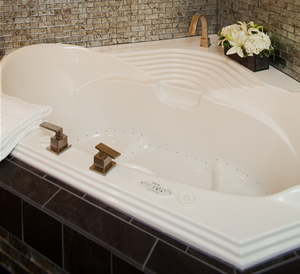 Located steps from your bed, is a two person corner Jacuzzi air tub with chromatherapy light. Also your room has a gas log fireplace which can be viewed from anywhere. Their location offers either direct access from your car or through the interior of the inn with courtyard access. Granite countertops surround the bar and bath featuring an in-room sink, refrigerator, coffeemaker and microwave to make your stay more comfortable. Added amenities are, 32” flat panel TV, iron and iron board, alarm clock, hair dryer, spa inspired bath soaps and shampoo, higher thread count linens, extra large bath towels, telephone, free Wi-Fi and individual climate control.